(CNS): Updated Monday 4 January. Police have now said that the 52-year-old woman who passed away on Wednesday 30 December 2009, following a diving trip on Grand Cayman was Cindy Neilsen, of Sandy, Utah, USA. At about 3.55 in the afternoon the woman became unwell and lost consciousness during an organised dive in the north side of the island. Ms Neilsen’s husband who was accompanying her on the dive and staff from the operator, Resort Sports, undertook CPR and conveyed his wife to shore. She was immediately taken to George Town hospital where she was found to be dead on arrival. Neilsen was said to be an experienced diver fand was a cruise ship passenger visiting the island with several members of her family. Police said that the enquiries into the death are ongoing. This is the ninth visitor to Cayman to have passed away in 2009 while in the water. 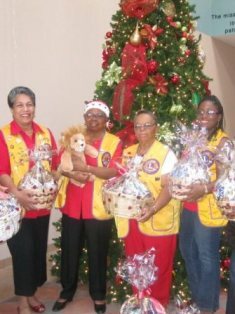 (CNS): Following a long held tradition the Lions of Tropical Gardens (LCTG) the lady members were out and about on Saturday 26 December making sure there was plenty of Christmas cheer as they delivered festive baskets to those working over the holidays. The day began with deliverires at the George Town Hospital followed by Chrissie Tomlinson Hospital, Maple House, George Town and West Bay Police Stations, HMP Fairbanks, East End Sunrise Cottage, Immigration Office at the Owen Roberts Airport, Pines Retirement Home, Golden Age Home, 911 and George Town and West Bay Fire Stations. The Lions also recognized the first baby to be delivered on Christmas morning and presented her with a ‘Lion’ toy. The children on the pediatric ward were also treated to gifts. Other recipients of gifts included – Additionally three families were included in the delivery process this year and they received hampers filled with groceries from the Lions. The delivery of Christmas Baskets has become a tradition for the Lions Club to show appreciation to the workers at all the essential services that often times have to work throughout the holiday period and they were warmly received. The Lions said that these workers miss out on having Christmas with their families so that the island as a whole can enjoy theirs. “They work long hours over the holidays and so the LCTG provide some "Goodies" that will keep them well nourished and remind them that there are those who care and appreciate the Sterling Service that they perform,” they added.